A new Sally Hepworth page-turner about that trickiest of relationships and what happens when it all goes wrong. Someone once told me that you have two families in your life-the one you are born into and the one you choose. But that's not entirely true is it? Yes, you may get to choose your partner, but you don't, for instance, choose your children. More importantly, you don't choose your mother-in-law. The cackling mercenaries of fate determine it all. From the moment Lucy met Diana, she was kept at arm's length. Diana is exquisitely polite, but Lucy knows, even after marrying Oliver, that they'll never have the closeness she'd been hoping for. But who could fault Diana? She was a pillar of the community, an advocate for social justice, the matriarch of a loving family. Lucy had wanted so much to please her new mother-in-law. That was ten years ago. Now, Diana has been found dead, leaving a suicide note. Lucy and Oliver wonder if her treatment for cancer had worn her down. The autopsy finds that Diana didn't have cancer, but it does reveal evidence of suffocation. Someone wanted Diana dead. 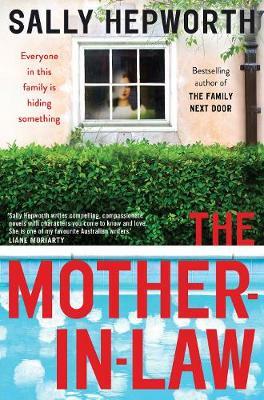 And everyone in the family is hiding something... From the bestselling author of The Family Next Door comes a new page-turner about that trickiest of relationships and what happens when it all goes wrong. Sally Hepworth has lived around the world, spending extended periods in Singapore, the UK and Canada, where she worked in event management and human resources. She is the author of The Secrets of Midwives, The Things We Keep, The Mother's Promise and The Family Next Door. Sally lives in Melbourne, Australia, with her husband and children.